You don't need a lakefront property to enjoy the benefits of backyard water. Stacked pots filled with a pump and filled to the brim produce sounds reminiscent of lapping waves. The vessels' rolled rims -- and resulting cascades -- amplify the sound of the water, and their coloring corresponds with a nearby begonia. 2. Plug the drainage hole of the largest pot with foam sealant. Place the pot on a level surface. Cut a length of 1-inch-diameter flexible plastic tubing that, when inserted into a 375-gallon-per-hour pump, extends through both support pots and 6 inches above the base of the smallest display pot. Insert the tubing into the pump. 3. Place the pump in the base pot, running the power cord over the rim, toward a grounded exterior outlet. 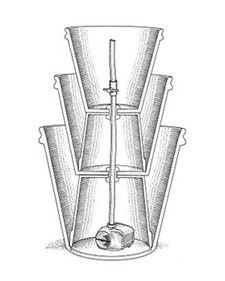 Invert the larger support pot over pump, propping it on wooden shims to allow water to flow underneath; feed the tubing through the drainage hole. Spray foam sealant around tubing to seal. 4. Position the second display pot; feed tube through hole. Seal with foam. Repeat with the remaining support and display pots. Add a flow-control valve a few inches from the end of the tube. Add water until the pots are overflowing; plug the pump into the outlet, adjusting pressure as needed.